Uniquely or daily: First impressions matter! Having a question, often our first reflex is to pull out the smartphone and directly expect an answer. Information must be in reach within seconds, the application must be simple and intuitive. Whether online shopping or just surfing – the use of mobile devices is growing steadily. Becoming a daily source of information requires persuasiveness from the first second: The first impression can decide about sympathy, perceived usefulness, and becoming a mobile companion or not. What are the experiences of potential customers or existing users when dealing with mobile content? Does the advertisement act as intended? Do people find what they are looking for? We can address these and many other questions using our eye tracking technology. Unfortunately we do not have any success stories in this area yet. Are you interested in a pilot project? Do not hesitate to contact us! 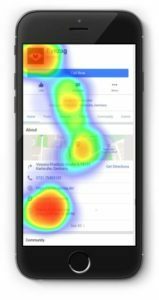 We offer two ways to test mobile content in eye tracking studies. On the one hand your content can be tested directly on the mobile devices of your participants, but there is also the possibility to illustrate them by simulating a mobile device on the desktop. Here we are mainly testing the first impression of the target group, which yields valuable insights about the first encounter with the content, scanning behaviour, and intuitive navigation. For the relevant part of the orientation and first impression phase, this is a powerful method for gathering user perception. Thus optimization potential can be identified and first action steps can be derived.